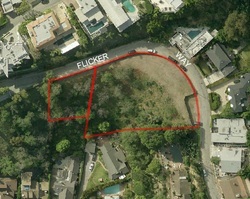 An unprecedented opportunity to acquire nearly one acre in the iconic Bird Streets with explosive city views. This is the largest undeveloped land in the Bird Streets on the market. Located in one of the world's most exclusive areas, this is the first offering of this property in multiple decades. The property consists of two parcels (APN: 4392-006-001 and 4392-006-005) with a combined total of approximately 40,410 square feet. The parcels are positioned on the view side of Flicker Way and are down-sloped, allowing for exceptional and uninterrupted city views. Poised to become the next trophy estate in the prime Sunset Strip, this truly is a once in a lifetime offering.